Prove What You Have Been Taught! There is NO MORE IMPORTANT QUESTION IN YOUR LIFE! Why, this matter concerns your eternity, and yet you probably never thought to really look into it, for yourself — in your own Bible! The statement we read from the book of Galatians actually sums up the whole of the Gospel — it is a condensed statement of the very PURPOSE and PLAN of God for mankind! Your hope of life eternal — of salvation — depends altogether on what is stated in that greatly misunderstood passage! In bringing a new message — the Gospel — Jesus came to confirm the promises made to the FATHERS. But who were the fathers? And what are the promises made to them? Heaven? — Purgatory—? 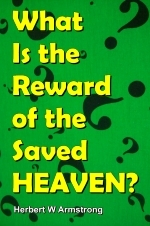 Your salvation depends on the answer! You read in Acts 3:13, in the inspired words of Peter: "The God of Abraham, and of Isaac, and of Jacob, the God of our fathers, hath glorified his Son Jesus." The fathers, then, were Abraham, Isaac, and Jacob. If you are Christ's — if you are a Christian — you are an heir to inherit — not what men might devise in their imaginations — you are an heir according to the promise! If you're an HEIR, you are going to inherit something. If you're an heir according to the promise, you are going to inherit whatever was promised — and not something else. Genesis 12:6-7: "And Abram passed through the land unto the place of Sichem, unto the plain of Moreh. And the Canaanite was then in the land. And the Eternal appeared unto Abram, and said, Unto thy seed will I give THIS LAND. SO the promise was the inheritance of the LAND OF PALESTINE. Genesis 15:18, "In the same day the Eternal made a covenant with Abram, saying, Unto thy seed have I given this land, from the river of Egypt unto the great river, the river Euphrates." From the Nile River in Egypt, to the Euphrates in the Near East! Incidentally, other scriptures show that the territory of Christ's Kingdom is to expand and spread until ultimately it shall include the whole earth. But now notice, after Abraham had obeyed — he been put to the test and found faithful — were there any further conditions to the promise? Let's read Genesis 22:15-18: "And the angel of the Eternal called unto Abraham out of heaven the second time, and said, By myself have I sworn, saith the Lord, for because thou hast done this thing, and hast not withheld thy son, thine only son: that in blessing I will bless thee, and in multiplying I will multiply thy seed as the stars of the heaven, and as the sand which is upon the sea shore; and thy seed shall possess the gate of his enemies; and in thy seed shall all the nations of the earth be blessed; because thou hast obeyed my voice." "Wherefore remember, that ye being in time past Gentiles in the flesh ...." Doesn't that plainly say they are no longer considered Gentiles? Paul continues: "Ye being in time past Gentiles ... that at that time ye were without Christ, being aliens from the commonwealth of Israel, and strangers from the covenants of promise ...."
"By faith Abraham, when he was called to go out into a place which he should after receive for an inheritance, obeyed; and he went out, not knowing whither he went. By faith he sojourned in the land of promise, as in a strange country." Notice carefully: Abraham merely sojourned in the land — which he was AFTER to receive for an INHERITANCE — dwelling in tabernacles with Isaac and Jacob, the heirs with him of the same promise: for he looked for a city which hath foundations, whose builder and maker is God .... These all died in faith, not having received the promises, but having seen them afar off." But that Kingdom, Jesus said, is not of this world — this age! In His great prophecy of world news today — of world wars, and 20th- century world upheaval now — Jesus Christ said, in Luke 21:31: "When ye see these things come to pass, know ye that the kingdom of God is nigh at hand." The Kingdom of God is to rule the world. It is not yet established — but today it is nigh at hand — and it's later than you think! In Luke 19 Jesus gave the parable of the "pounds," because they thought the Kingdom of God should immediately appear. He represented Himself as the young nobleman going to the far country — heaven — to receive the right to rule the kingdom, showing it would be set up and take over the rule over all nations, at the second coming of Christ! I Cor. 15:12-18: "Now if Christ be preached that he ROSE from the dead, how say some among you that there is no resurrection of the dead? ... For if the dead rise not, then is not Christ raised: and if Christ be not raised, your faith is vain; ye are yet in your sins. Then [unless there is to be a resurrection from the dead] they also which are fallen asleep in Christ are perished." Strong scripture, that! I've heard this text twisted around and perverted to try to prove that Abraham is not dead, has already gone to and come into his promised reward, and will never be resurrected, just the diametrical opposite of what Jesus used it to prove. "As touching the resurrection ...," the resurrection of the DEAD, Jesus said, "God is the God of the living." Abraham died. But he will live through a resurrection. What Is the PLACE Jesus Is Preparing?